You are currently browsing the tag archive for the ‘$4 a gallon’ tag. Time’s up. Have you learned the lesson? It’s eerie to open today’s newspaper and see the headline “Gas at $4.” Because this is exactly how the World Without Oil serious game began, which launched exactly one year ago today. 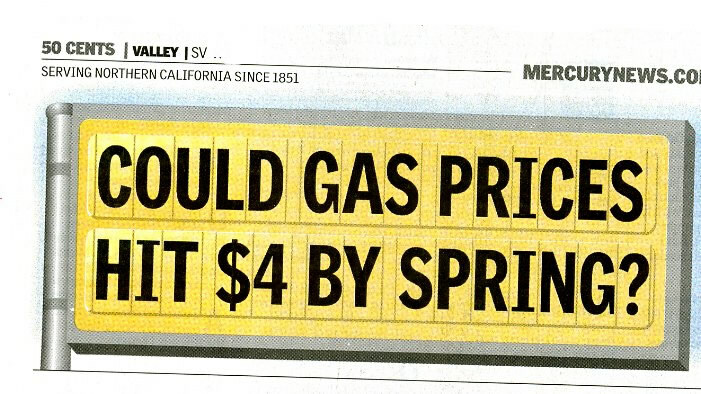 It’s depressing of course to see U.S. gas prices dominate our news, because they are unimportant. Or, rather, are important only if they lead us to see the actual problem (which is the role they served in the WWO game). The actual problem being that, in today’s world, people starve without oil. I mean that in both an economic sense and literally. And what we learned in WWO is that yes, you can prevent people from starving, both economically and literally. But right now you can’t do it without more oil. You can stop crime, get more water, quell disorders, recover from disasters, address climate change. You just can’t do it without using more oil. You can build a hydrogen economy, nuclear power plants, an all-sustainable energy grid. You just can’t do it without using more oil. Where do you get this oil? There are no more gushers, no more huge oilfields, no more cornucopia. The world’s oil industry is now in its Red Queen phase, running as fast as it can to stay in the same place. What WWO players came to experience is that the oil was going to come from them. From people, that is, who use a lot and have no good claim on it other than that they used to be able to afford as much as they wanted. The inexorable logic of this led many of them to change their real-life lives. They can’t change U.S. energy policy or the production capacity of a Middle Eastern oilfield – but they could (and did) change their own consumption. Thus adding their bit to the angle of the trim tab that will in time alter the course of the great big ship. How about you? Gas is hitting $4 a gallon in the U.S., 129p a litre in the UK. Is the game is starting, for real this time? What have you learned?